I promised (even in jest), so I deliver! You’re looking at the only flower I kind of regret. I was lazy and didn’t switch from the darker thread when I started sewing together the lighter flowers. Remember that the photo you’re seeing is likely larger than it is in real life, where it measures just over 2.5″ tall, so the stitches aren’t quite so pronounced in person as in the picture. This is the only light flower that got the darker thread, for reasons that should be obvious. I justified not ripping out the stitches by telling myself that it adds a homier “make do” feel to the project, but it’s just me not wanting to spend more time undoing it and then cursing to myself as I redid it. I learned that I need to be neater on the corners. On the back, the whipstitches are clear, as are the little balls of thread in the corners. I’ve been double stitching each corner and finishing each side with a knot, but maybe it’s too much? I don’t know. You’ll also note that I settled into a different basting pattern than on my orange diamond’s hexagons, which were my very first. I’m now only knotting in the beginning and letting my tail hang against the paper by putting it through the fabric one more time. At first, I was holding the fabric to the paper hexagon while I stitched, but that was fiddly and annoying, so now I’m basting with a tiny smudge of Elmer’s washable school glue stick. I’ve also started doing a tack stitch over each corner. It’s more secure and lets me put the hex down at a moment’s notice without losing all of my work. The six on the paper hexagon not only lets me find the top of the flower when I’m on the go (most of the flowers are directional) but also reminds me of its order in the pattern without having to look up a reference photo. This has simplified things for me more than once, since I have them laid out in a not-smart, very kid-accessible place. As an aside, I’m really not looking forward to prying all of the papers out of the fully-joined hexagons, so I’m putting it off. I still haven’t gotten the starch yet, so that’s my excuse. 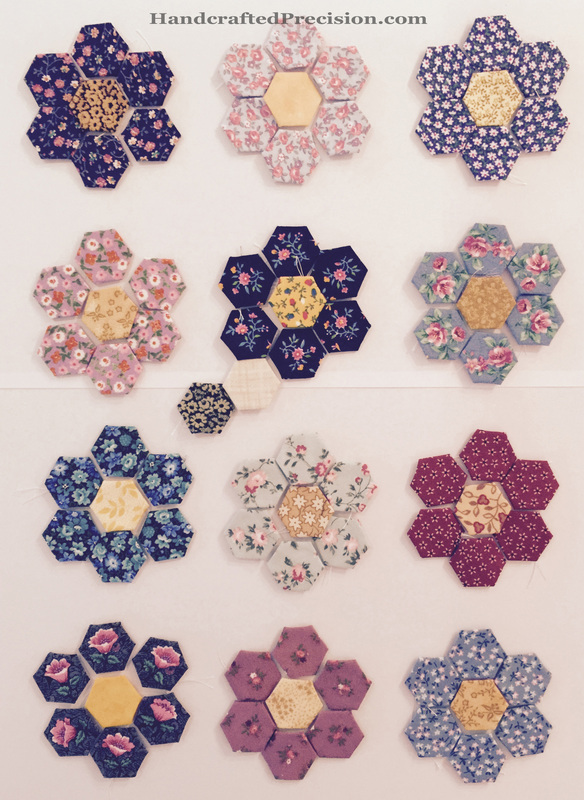 This entry was posted in English Paper Piecing, Grandmother's Flower Garden, Hand Sewing, Hexagons, Technique and tagged Tiny Flower Garden on November 30, 2014 by HP. And the third! This one’s looking nice and stumpy, like a pumpkin should. Well, a little more wrinkly than a pumpkin should, buy you know how it is. The broader stem looks better to me than the thinner on in the second block, but I’m going to keep changing it up. Same with the leaves. I like that they’re different for each block. I think that’s the kind of variety that would interest a toddler. I love the green fabric for the leaf. It’s from my eBayed scraps. I have a feeling those are going to be the scraps that keep on givin’. I’m thinking three more of these big pumpkins (the very first one is going to go on the back) for a total of five, then I’ll lay them out on the floor (no design wall yet) next to a tape measure and figure out the range of sizes I can use for the smaller pumpkin blocks. I’m really excited about this project now that I figured out that my seam consistency problem was really my machine’s problem all along. When I was using my 1/4″ foot, the feed dogs were too wide to both grab my fabric, so it would shoot off to the side as I sewed, even slowly. 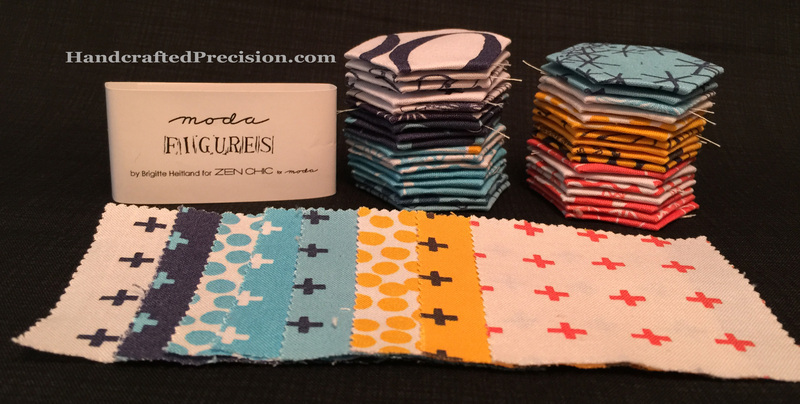 I switched back to a regular foot and just moved my needle position so that I can line my fabric up with on the of lines on the needle plate and be sure of a 1/4″ seam. I also bought a walking foot, which helps. My lines are still a little curvy, but THAT’s where practice will make (almost) perfect. This entry was posted in Machine Piecing and tagged Pumpkin Patch on November 26, 2014 by HP. 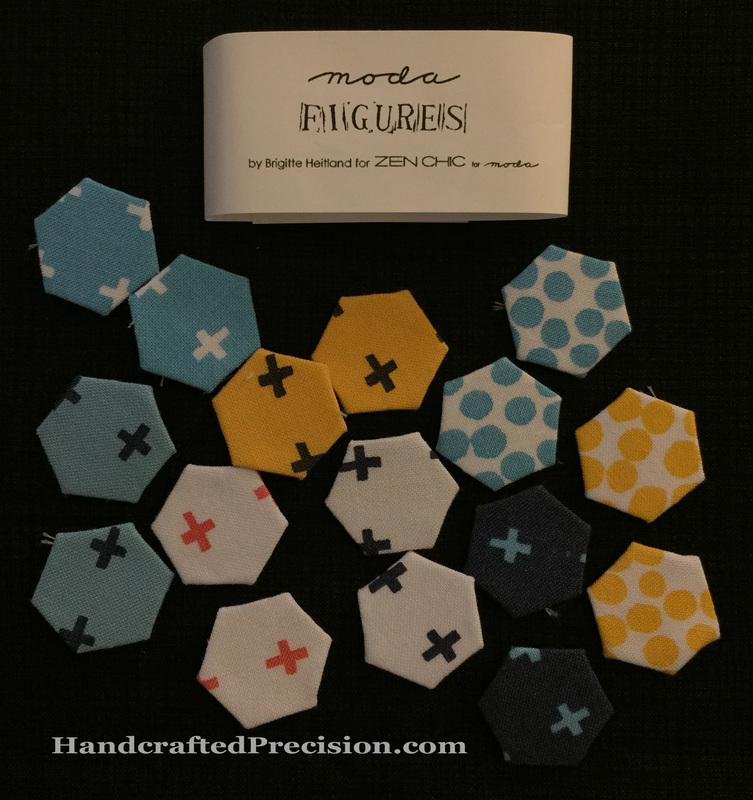 One more mini charm pack basted onto 1″ and 1/2″ hexagons. This time, it’s Figures for Moda, which I love. 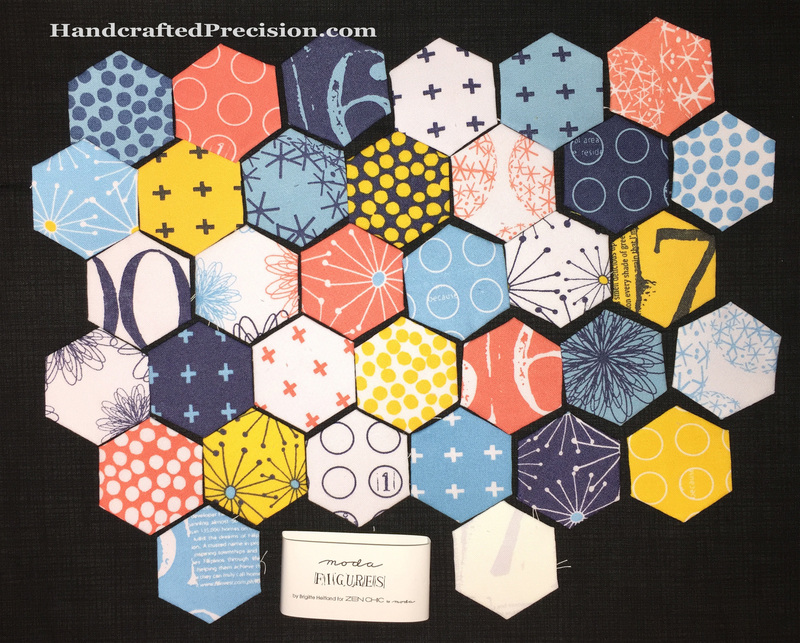 I really like this fabric line, but these 1/2″ hexagons aren’t going to be too useful in my main hexagon project (“I’m Not a Machine”), I think, because two of them are mostly white and the dots have a lot of white background. We’ll see, though. 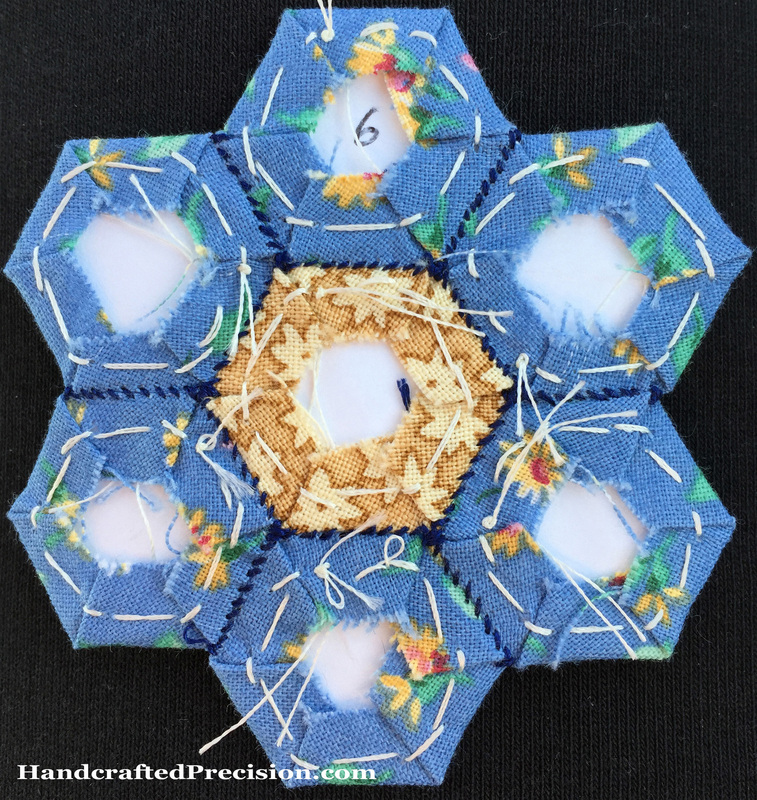 This entry was posted in English Paper Piecing, Hand Sewing, Hexagons, Precuts and tagged Figures on November 18, 2014 by HP. I’ve decided to go with a lighter, more random beige for my background: It’s Hoopla and Everyday Fun by Jennifer Heynen. I love it and I’m glad I’m going to have scraps of it after I’m done with “Tiny Flower Garden”. I might even need to buy more before it leaves stores forever. This entry was posted in Beige, Stash and tagged Tiny Flower Garden on November 16, 2014 by HP. I took the scrappy flying geese from my second scrap class (that were supposed to become a table runner) and made them into a tiny couch blanket for my toddler, Sec. He loves getting on the couch and spreading one of the knit or crocheted blankets I made over himself, but they’re all too big for him. I wanted him to have something just for him, and those flying geese fit the bill. As soon as I gave it to him, he ran to the couch, climbed up, put it over his legs, and smoothed it down. So adorable! The only sad thing is that it’s almost too small for him. I need to make him another. This was the first time I used Warm and White batting (instead of the polyester stuff) and it was amazing. The batting itself actually felt like a blanket, as did the quilt when it was finished. I don’t think I’ll ever use the polyester stuff again. Yuck. The two borders and the backing are from my eBayed scraps (yay!). The green binding is leftover from binding another project over the summer, which I haven’t blogged yet. I’m really happy with how the colors came together, and that I didn’t have to buy anything special for it. I still need to make a label and sew it to the back. I’ll have to do it when Sec is at school, since he wouldn’t even let me take it from him to measure it. I had to wait until he was asleep. 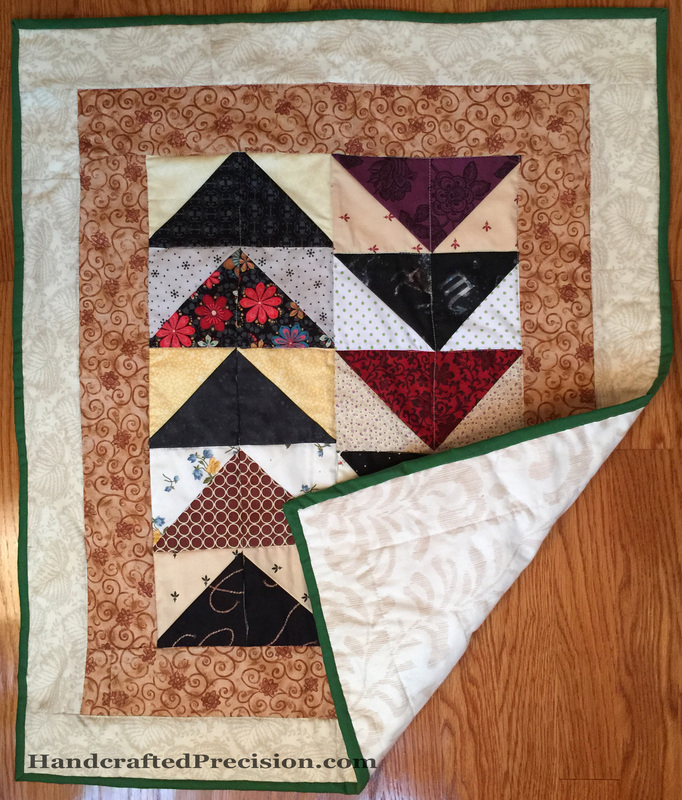 Unfortunately, I learned that I don’t love machine quilting, even something so small. I’ll give it another shot, but it’s not looking like something I’m going to do a lot of in the future. Now I have to find a good long-armer. Can you hire a long-armer to quilt something so small? I’d guess yes, but I don’t know. 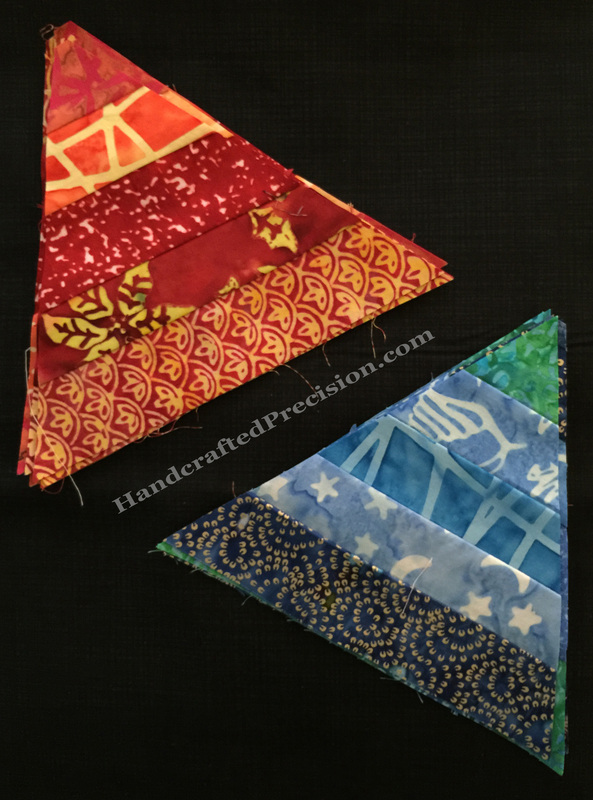 This entry was posted in Finish, Quilt and tagged Passing Geese on November 15, 2014 by HP. 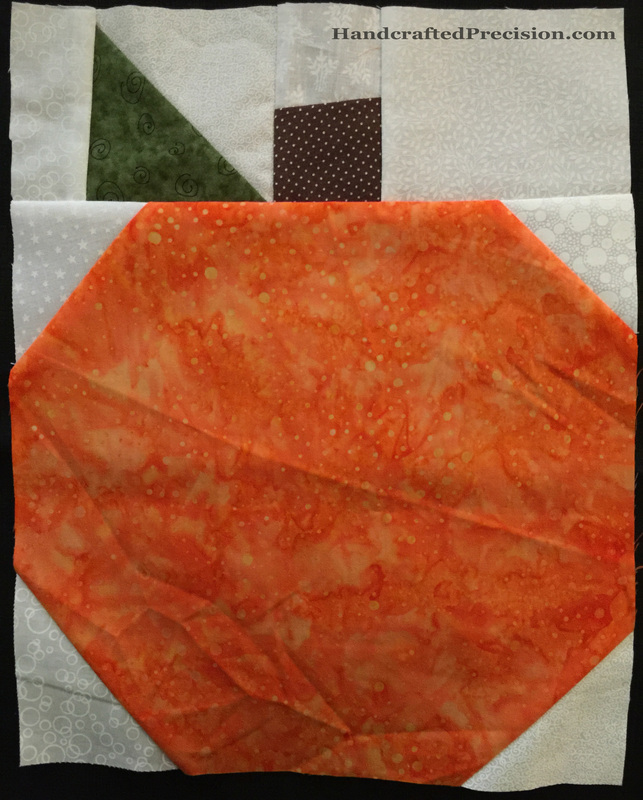 I chose and cut fabrics for all of the scrappy green leaves and got them basted onto their hexagons. I was originally going to just use the green flowers fabric but I realized it’s the same design as the yellow flower center in the upper left. That would have been weird. Scrappy’s the way to go for this little wall-hanging anyway, I think, but I’m not so sure about that green and white gingham on the left. It’s a little too pale. I’ll leave it for now and let it sit in my brain. I also finalized the scrappy yellow flower centers. You’ll note that there’s one repeated fabric. It looked best with those flowers and I decided not to sweat it. It’s supposed to be eclectic and scrappy. I’m using what I have. You’ll see that I basted a dozen or so of the tan crosshatch background and I hate it. It’s too dark and too rigid and formal. Back to the fabric store, I guess. I’m sure I can use it for something else, but if I’m putting all of this time into the hand sewing, I want to LOVE the final product, even if it’s not totally my thing. You’ll also note that I’ve already sewn some of the flowers together and hit with the iron. Progress! The older EPP guru lady at the fabric store said to use heavy starch, so I’ll need to get some at the grocery store. The colors aren’t showing true in this photo. I think that the beige background crosshatch fabric might be a little too dark and a little too boring. You can click through for a full-sized picture. I’m trying not to stress too much about it since it’s a practice project (and my first EPP project), and it’s for Prim and he’ll like it no matter how it turns out. I guess I have to go back to the fabric store. 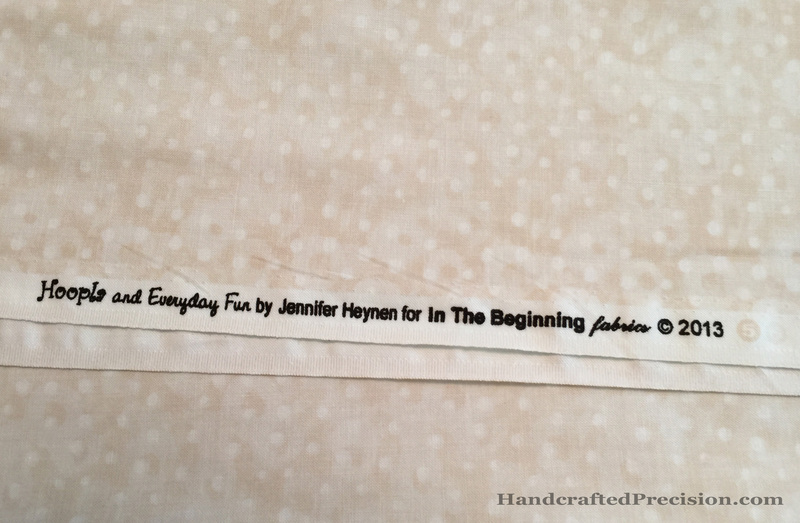 <sigh> I thought that since the 1/2″ hexes were so small I’d be buying a lot less fabric. Things have not turned out that way so far. 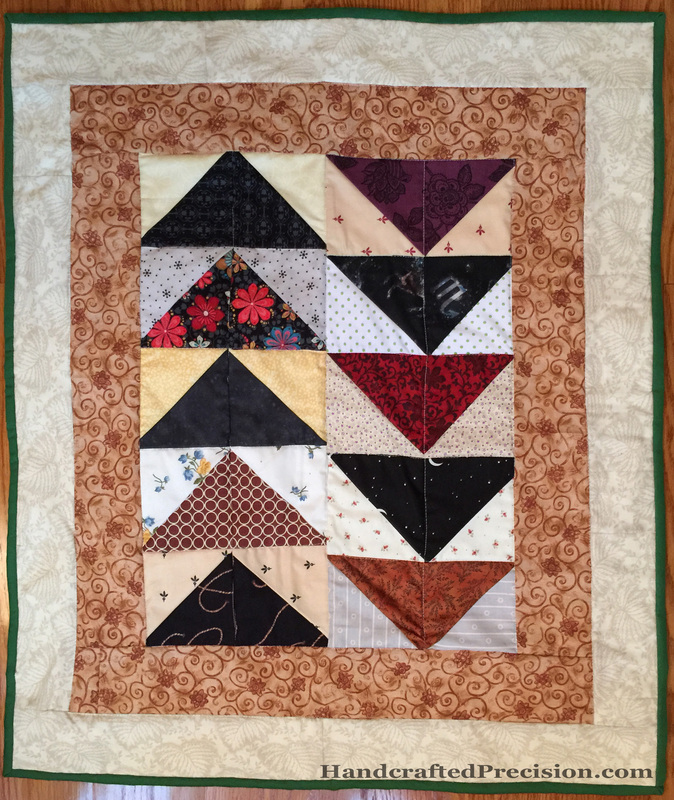 It’s not terrible, since I’m a new sewer and have very little in my stash to begin with–and I am still pursuing some machine-pieced projects. I’m just infatuated with the hexagons lately. I need a permanent place for my sewing machine. Dragging it out every time is getting old, which is why I think I’m favoring the hand sewing. It’s much easier to get my little container of supplies and get set up to hand sew. I’ve managed to put my mind at ease about the whole “some stitches show on the front” issue. I’ve come to rest at “good, because it’s handmade–people aren’t machines”. And that’s an okay place for me, I think. I am regretting being lazy for one of the light flowers and not changing out to a lighter thread. Maybe I’ll take photos of it and pretend I did it on purpose to show my process. Ha! 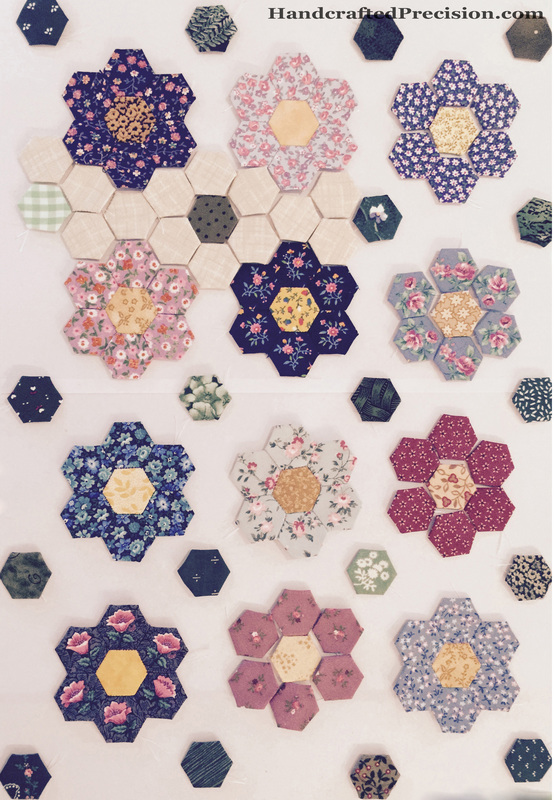 This entry was posted in English Paper Piecing, Grandmother's Flower Garden, Hand Sewing, Hexagons and tagged Tiny Flower Garden on November 9, 2014 by HP. Since “Tiny Flower Garden” is a practice project, I’ve decided not to agonize over it (anymore). I decided on a layout. Also, I think twelve flowers is about my maximum. It’s going to be a wall-hanging. For an idea of scale, this layout mostly fills two sheets of letter-sized paper. You can see that I decided on scrappy centers. The bright yellow, while a fun fabric that I’m glad is in my stash, just didn’t look right with the other fabrics. I’ve kept one center in that fabric, though, since I need some movement and interest. I don’t want to have all of the centers (or the flowers, for that matter) in the same value range. I was trying to figure out what to do with it when it’s done, when Prim walked by it as I was taking the picture and said, “Ooh! It’s so pretty!” I asked him if he wanted it to hang on his wall when it was finished, he enthusiastically agreed, so now it has a home. Also, even though I don’t love the Grandmother’s Flower Garden Pattern, I find that I like working on it more now that it’s for him and not just an exercise or technique practice. I really like the green flowers for the dots. They’ll blend in well. I also like the light beige crosshatch background hex a lot more, which is great, since I have a yard of that fabric. I won’t need anywhere near that much for this project, but it’s a great neutral. I was just worried that it wouldn’t look right. I’ve been impatient about actually sewing things together, so I’ll baste the rest of the green “leaves” and background pieces later. Next up, joining flowers! 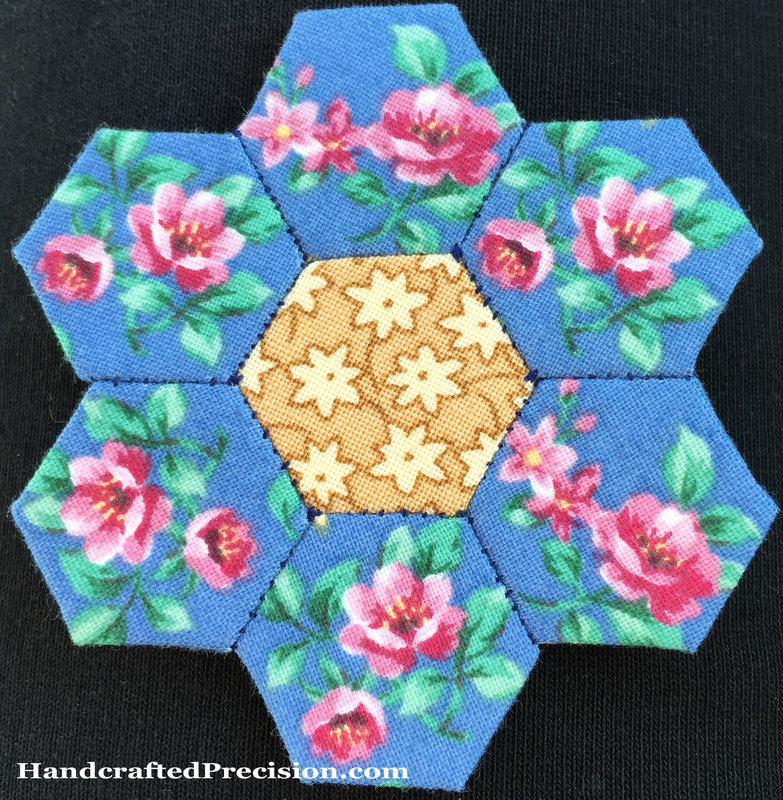 This entry was posted in English Paper Piecing, Grandmother's Flower Garden, Hand Sewing, Hexagons and tagged Tiny Flower Garden on November 2, 2014 by HP.